Parliament in Kyrgyzstan has adopted legislation making it possible for former presidents to be stripped of immunity should they engage in political activity. Of the120 lawmakers in the Jogorku Kenesh, 111 voted on April 4 in favor of the change to the law. 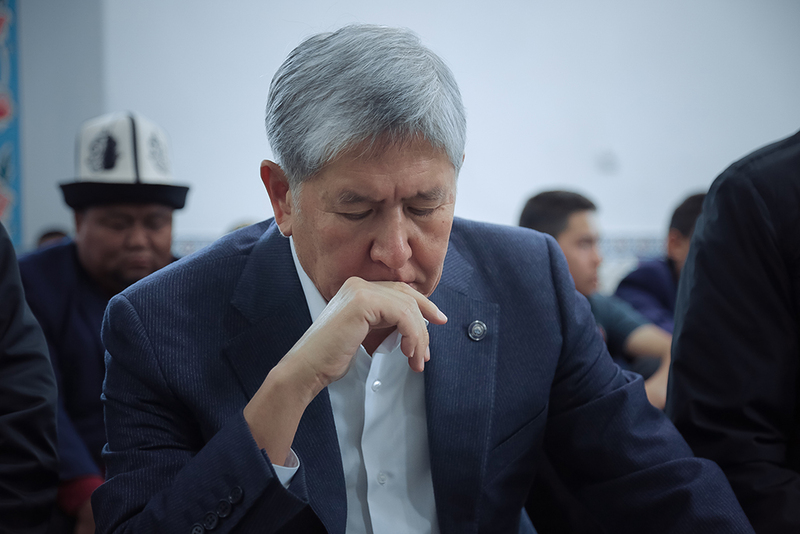 The stripping of immunity is a transparently ad personam measure aimed at ex-President Almazbek Atambayev, who has over the past year or so engaged in a losing battle of attrition with his successor, Sooronbai Jeenbekov. The legislation adopted by deputies stipulates that former heads of state may not engage in politics or hold “special state positions.” Any ex-president found to be in violation of these prohibitions will lose not just legal immunity but also other benefits granted by the state to the emeritus holders of the office, including salaries, residences and transportation. This opens the way to parliament granting prosecutors the power to file criminal charges against ex-presidents for any offenses committed by them while in office. Lawmakers and Jeenbekov have sought very unconvincingly and disingenuously to claim that this initiative was not cooked up with Atambayev in mind. As it is, only he and one other person, Roza Otunbayeva, who served briefly in interim capacity after the 2010 revolution, could fall prey to the provision. Other former heads of state, Askar Akayev and Kurmanbek Bakiyev, lost their privileges when they were ejected from office by popular uprisings in 2005 and 2010, respectively. The fine-tuning effected to this legislation in the months since it was first aired puts lie to all the dissembling. The initial proposal envisioned no particular conditions for immunity being revoked. The detail about political activity is quite plainly a nod to unraveling developments in the Social Democratic Party, or SDPK. Atambayev was a founding father of the SDPK. Last March, just four months after he stepped down from the presidency, having served his single permitted six-year term, he was overwhelmingly re-elected chairman of the party. He used that opportunity to take a potshot at Jeenbekov, a former protege that he had handpicked to become his successor. Atambayev’s expectation had apparently been that he would be allowed to continue effectively help running the country from his new perch. Jeenbekov swiftly dashed Atambayev’s hopes and went even further by firing and then jailing some of the ex-president’s top cronies, including one-time Prime Minister Sapar Isakov, who is currently awaiting trial on corruption charges. The SDPK has now descended into a farcical, split-personality sideshow. While the party’s parliamentary incarnation has foresworn its chief, there is a parallel structure that still maintains loyalty to Atambayev. On April 3, a dissident, anti-Atambayev wing of the party mustered in Bishkek to expel the president from their ranks. The ex-governor of the Chui region, Sagynbek Abdrakhmanov, was voted in as his replacement as party leader. SDPK spokeswomen Kunduz Djoldunbayeva told Interfax news agency that Abdrakhmanov presided over a gathering of people unrelated to the party. Both the congress and its delegates were frauds, she said. The other SDPK is scheduled to hold its congress on April 6.